Save $28 when you buy these three products together, get FREE shipping, and have great-looking skin in just four weeks! 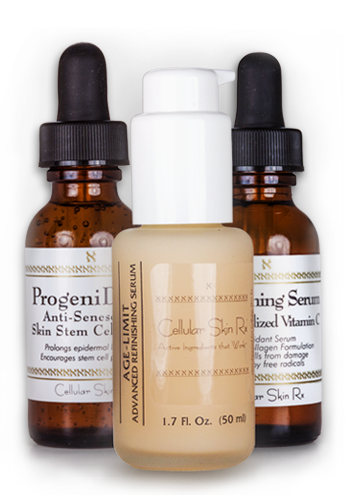 These products are the core of the Cellular Skin RX skin care line. Routine use will get you the results you want and need – quickly. How? Skin needs to be exfoliated, protected, and stimulated on a regular basis to look its best. Old skin needs to be removed, the production of new skin needs a little boost for those of us of a certain age, and that new glowy skin needs protection, too. For more details, visit Dr Glow Girl’s post on how easy it can be to look radiant in such short time. Age-Limit Advanced Refinishing serum gently but effectively dissolves the “glue” that holds old, dead skin cells together. Lactic acid, glycolic acid and arginine work together to remove dull skin and reveal fresh new skin. Vitamin C+ Firming serum provides free radical protection for these fresh new skin cells and provides the l-ascorbic acid necessary for collagen synthesis, keeping your complexion smooth and supple. Additionally, l-ascorbic acid limits melanin production so age spots fade away over time. ProgeniDerm™ Anti-Senescence Skin Stem Cell serum stimulates master epidermal cells to make more new cells and protects the DNA of existing cells, prolonging cell life and keeping your complexion looking fresher, younger. Around middle age the ratio of new skin cells on our faces to older, dying cells reverses, leaving us with a greater number of older cells present. ProgeniDerm™ works to reverse this ratio by stimulating the production of more new skin cells. You can expect a beautiful glowing complexion to emerge in just four weeks! Apply vitamin C+ Firming serum followed by ProgeniDerm™ Anti-Senescence Skin Stem Cell serum. Night A: Apply Age-Limit Advanced Refinishing serum followed by vitamin C+ Firming serum. Night B: Apply vitamin C+ Firming serum followed by ProgeniDerm™ Anti-Senescence Skin Stem Cell serum. Alternate Nights A and B. Want faster, more dramatic results? Add new CSRx Retinol Peptide Resurfacing Complex to this routine. Use your Retinol Complex on Night B after applying your C+ Firming serum. Use a moisturizer if needed after applying ProgeniDerm™ Anti-Senescence Skin Stem Cell serum morning and/or night. I’m just past 50 and I heard about Cellular Skin Rx from a friend who worked there. She said this kit was the quickest way to get my skin back in shape. I’m an old sun worshiper and had some age spots and generally uneven skin tone and texture problems. I figured I was just stuck with it. She talked me into buying this kit and boy am I ever glad I did. It’s been just a couple of weeks now but my skin is so much brighter, smoother, clearer-looking. I was so surprised. Even my boyfriend noticed! Thanks to CSRx for this great product combo! I saw this kit on Facebook and decided to give it a try. It’s been almost four weeks now and I’m already getting lots of compliments on my skin. I especially love the way the C makes your skin feel warm when you put it on. Plus, it’s been a month and I have a lot of serum left for the next couple of months. Thanks for helping this 48 year old look 39 again! Add our new CSRx Retinol Peptide Resurfacing Complex to perfect your anti-aging skincare routine. Alternate your Age Limit Advanced Refinishing serum with CSRx Retinol Peptide Resurfacing Complex each night for quicker results and faster skin cell turnover. Can even be applied around your lips without any issues. Apply your vitamin C+ Firming serum then your Retinol Complex. Top off with moisturizer if you have sensitive or dry skin. Add our new Retinol Peptide Resurfacing Complex to your Great Skin in Four Weeks order for just $45! You save $20! Use Coupon Code GREATSKIN20 at checkout. Apply your vitamin C+ Firming serum on Night B and then follow with your Retinol Peptide Resurfacing Complex. Sorry! This coupon code cannot be combined with other coupon codes. Limit one per purchase.